Instead of buying envelopes, you can make beautiful ones of your own to match your equally as beautiful home-made greeting cards. I know I appreciate home-made cards over generic store bought ones. You can make unusual folded envelopes with curved flaps from construction paper or left over gift wrapping paper. You can also make a simple magnetic foam envelopes from craft foam and two strong magnets to store yours school supplies in your school locker. Too see the template bigger, please click here. 1 piece of wallpaper 23" x 26" (although any large paper would do), pencil, ruler, scissors, and paste. If this is envelope for your students' craft work, first draw a template so that they can trace yours. Draw envelope pattern (sketch a) on wallpaper, with a ruler, and cut out. Fold sides of envelope to center, overlapping as shown in sketch b and then paste them together. Fold bottom section up and paste. 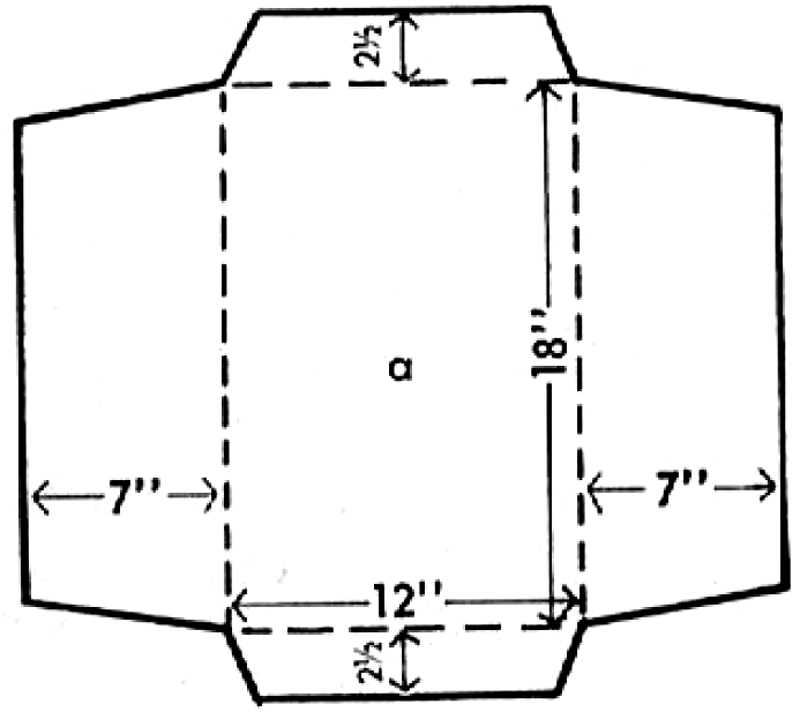 Fold top section down (sketch c). Write your name on envelope. Making Your Own Xmas Envelopes - These envelopes aren't too hard to make, find out the patterns and the directions. Art Cards with Easy to Make Envelopes Project for Kids - These cards with matching envelopes will make great gifts to friends and family. Blank Crafty Envelopes Crafts Activity -Here are a few creative blank envelopes you can print and decorate. Bunny Envelope Making Instructions - Learn how to make these adorable Easter bunny envelopes. Curved-Flap Envelope Craft Paper Folding Craft - Learn how to make this cute curved-flap envelope by following these instructions. Cute Envelopes with Free Printable Craft for Children - Follow these instructions to making very cute envelopes. Envelope Bunny Easter Craft - This Easter craft is a favorite in classrooms and scout troops. Envelopes - Learn how to make heart-shaped envelopes for Valentine's Day. Hand-Made Envelope Craft - Make beautiful handmade envelopes out of old wrapping paper, catalogs, brochures etc. How to Make Stationery - Learn how you can make envelopes from recycled materials. Locker Pockets - These magnetize envelopes are prefect organizers for your school locker. 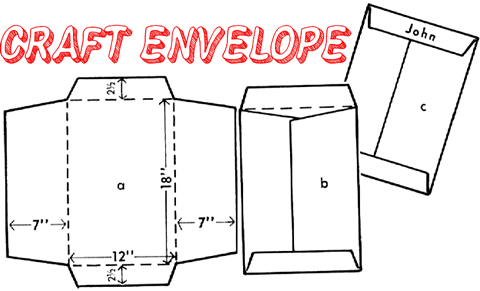 Make Your Own Envelope - Follow these instructions to make homemade sassy envelopes. Mini Origami Envelopes - Make a lot of these cute envelopes SWAPs to give to all your troop members. One-of-a-Kind Envelopes and Greeting Cards - Make one-of-a-kind greeting cards with matching envelopes using recycled materials such as wrapping paper and magazines. Paper Valentine Envelopes Children Can Make - Use these free printable valentines envelopes to for your Valentine's Day cards. Pretty Plastic Pocketbook - Learn how to make a pretty plastic pocketbook using a poly envelope with Velcro closure, ribbon, and other materials. Recycled Calendar Envelopes - Recycle your favorite old calendars to make beautiful envelopes. Recycled Stationery - Find out how you can make stationery from old calendars and a few other inexpensive supplies. Red Envelopes - Learn how to make the traditional Chinese New Year Red envelope. Star Stamps - These star stamps would look amazing on your homemade envelopes!